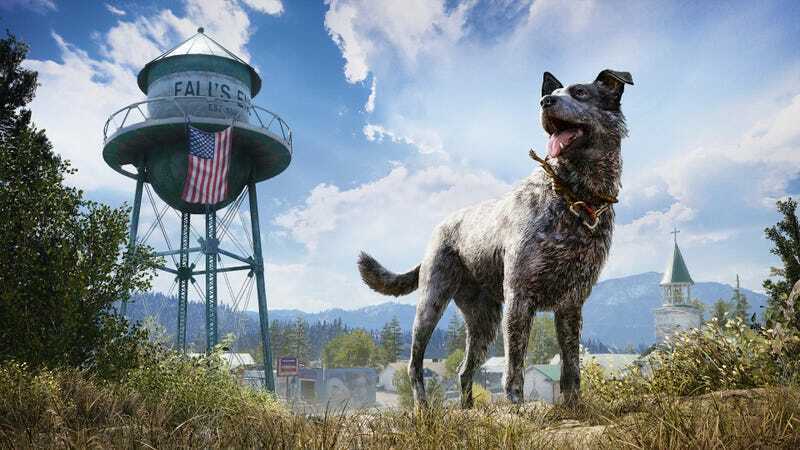 Far Cry 5 has given us a wonderful ally named Boomer. He’s a dog, and he’s my friend, but I don’t use him because I hate seeing and hearing him get hurt. I am a big fan of animal companions in games, and Boomer is one of the best that we’ve gotten so far. He’s got the physical prowess of a bear and the eyesight of an eagle. Most importantly, he is a cute dog. However, being a companion in a Far Cry game, he also has to get into fights. When he gets into fights he gets hurt. That’s where the trouble starts for me. You see, when Boomer heroically takes bullets in my stead, he makes a horrifying whining sound. It sounds like a real dog getting hurt. Likewise, when he’s hit by a vehicle (like in this video), the sound of the “thump” and the whine really do mimic the awful noises of when those things happen in real life. Hearing Boomer get hurt makes me extremely sad. It makes me so sad, and emotional even, that I don’t want to play the game any longer. Why though? I don’t have the same emotional reaction when my human allies collapse in a heap after eating a rocket launcher shot from point-blank range. Their moans don’t affect me in the slightest where Boomer’s make me want to turn the game off for good. And I can shoot the moose, bears, cougars, and turkeys of Far Cry 5 with a minimal tinge of guilt in my heart. When it comes to Boomer, my pet ally, I just can’t handle what is regular and routine at every other point in the game. I put this question to my friend Dr. James Stanescu. Alongside being a really smart person who I’ve known for a very long time, he’s also an Assistant Professor of Communication Studies at Mercer University, and his work centers on animals and ethics. He also plays video games every now and again, so I casually asked him about why I have such an emotional reaction to hearing my dog companion get injured in Far Cry 5. It probably says something about me as a person that these video game dogs elicit this response from me more than video game humans do. As Stanescu suggests, listening to Boomer get hurt makes me feel like I’ve failed in some tragic way. My “fur baby” is a creature that I’m supposed to be protecting from harm. My other allies have guns, but Boomer only has me, and hearing that thump and horrible wail directly holds me accountable for messing up. So for me it’s flamethrower redneck and giant bear allies for the foreseeable future.